Congratulations to Ed Hamer, Claire Heughan, Jacob Davey & Lee Pessall, who were the pool winners at yesterday’s Quarterly Medal. Ed, Claire, Jacob & Lee have all now qualified to compete in the “Medal of Medallists” knockout tournament to be held on Finals Day on 6 December. Aus & Vic Opens, Exhibition St Cup, Queen’s Birthday Handicap Doubles, Richmond Silver Racket, Melbourne Cup Day Handicap Doubles, New Year’s Eve Handicap Doubles. Boomerang Cup, Roo Trophy, Aus & Vic Amateurs, JB Box Trophy, Joan M Hayne. Night pennant, Quarterly Medals, Old Scholars, 100 years + doubles, ANZAC Day Trophy, Breakfast tournaments, Mixed Doubles, North African, Internationality, Jim Bailey, Parent & Offspring, Melbourne Masters Doubles, club matches, President’s Cup, Larwood & Eureka Cups, Barry Toates Trophy. Percy Finch, Judith Clarke, Club Championships of all grades (singles & doubles) other than the A-Grade singles and the Alan Hamer Cup, John Poolman Trophy. RMTC members who have paid an entrance fee, + juniors & associates, who are not ex-professionals. A-Grade singles (+ Gold Racket Qualifier & Gold Racket), Alan Hamer Cup. The third Quarterly Medal Competition of 2009 will be played on Saturday 29 August. As before, it will be a round-robin, handicap singles event played on the clock in morning and afternoon groups. Morning and afternoon tea and a light lunch is included. Most importantly, winners of the Quarterly Medal competitions qualify to compete in the Medal of Medallists knockout tournament on Finals Day on 7 December. To enter this competition, please contact the pros on 9429 8744 or email pros@rmtc.com.au Don’t forget to let them know whether you want to play in the morning or afternoon competition. There is also a sign-up sheet at the club. Places are limited, so don’t delay. Do you have any friends or colleagues that are interested in real tennis and are potential future members of the Royal Melbourne Tennis Club? If so, we will be holding Introduction Nights on Friday, September 4th and Monday, September 7th. The night will involve a tour of the Club and its facilities, a talk on real tennis and an exhibition by the Pros, as well as an opportunity for people to get on court to experience the game. Finger food will also be provided, and drinks available for purchase from the bar. Apart from drinks, there will be no cost for the evening. Guests should be instructed to wear (preferably white) tennis clothing & non-marking shoes, and club rackets will of course be available. This is a great opportunity for potential new members to see the game played at a high standard and to give it a go for themselves. If you have a friend or colleague who you’d like to bring along, please call the pros on 9429 8744 or email pros@rmtc.com.au to let them know which evening you’d like to attend and the name(s) of the person/people you’ll be bringing along. There is also a sign-up sheet for these evenings at the club. Please get in early to confirm your attendance, as these evenings have proven extremely popular in the past. Notwithstanding some especially dilatory ‘management’ by the tournament organiser, six players contested the (45+) D-grade club championship this week-end, resulting in exciting and fruitful matches. Saturday’s first round was particularly punchy as Vince Scopelliti took on Charlie Mackinnon in this highly anticipated battle between the two of the club’s personal trainer’s keenest devotees. Despite losing the second set 1/6, Scopelliti was surprisingly convincing in his 6/4, 1/6, 6/4 win, crediting his energetic play to his new regime of regular and punishing workouts. Charlie was left to ponder just exactly what it was Vince was getting from Nadine that he wasn’t. The other first round match saw juicy opponents in the two squash players Ed Small and John Piccolo. Despite his relatively fresh status, Piccolo produced some ripe tennis that won the match from 5 all, 40/30 down in the fifth confounding Ed, and the gallery. Sunday brought the semi finals and two experienced opponents in Greg Moran and Prue Atkins to take on Scopelliti and Piccolo. Brimming with confidence from Saturday’s win, Scopelliti charged to an early 5/1 lead but tightened to allow Moran into the match finally succumbing 5/6, 1/6 after an intense first set. With players and spectators enjoying some delicious and exotic fruit in the bar, along with delicious and exotic tales involving the African rescue of Kate Leeming by Joanna Lumley and a gang of 25 Gurkhas (see Shane McNeice for details), play got under way in the second semi. As expected, Prue won easily 6/3 in the first but it was clear Piccolo was improving with every rest. Despite some valiant tennis from Prue, John went on to confirm his arrival to the game with an exciting 6/4, 6/4 finish and a birth in the final. Moran and Piccolo had both played well but the story of the weekend was definitely all about the new arrival, Piccolo. Despite Greg’s calm exterior, it seemed the unknown quantity of Piccolo had unsettled him and the first set went to a nail biting 6/5 only just in his Moran’s favour. However, as with his semi against Scopelliti, Moran relaxed significantly with a set under his belt and took the D grade club championship in delectable style winning 6/1 in the second. Thanks go to Chris Chapman and the recently rescued Kate Leeming for marking and of course to the Pro Shop for organising another succulent event. Congratulations to Greg Moran and well done to all competitors for making the (45+) D grade championship a fine spectacle. Best of luck to many of you for your C grade pennant matches on Tuesday night. Sixteen of the club’s leading players, three professional and thirteen amateur, participated in the Richmond Silver Racket over the week-end for open handicap singles, with best of three set matches. I make no apology for once again highlighting the encouraging fact that this event was also dominated by the younger generation: the four semi-finalists were aged 20, 21, 23, and Richard Allen. One such young Turk gleefully pointed out to me that every first round match bar one (ignoring the indeterminate match between the Welch twins) had been won by the younger player. The tournament winner was Paul Rosedale, as old as his handicap of 20, who defeated Chris Chapman in the final 6/1, 6/4. Both players had earlier overcome determined semi-final opponents (Daniel Williams and Richard Allen, respectively) by an identical margin of 6/4 in the third set. The final was a fluent match full of sparkling stroke play, but Chris was always struggling to give ½ 30, owe 30 to such a dangerous opponent. There were many games when Chris would graft manfully to achieve 30 all, for example, before Paul would blithely unleash a couple of rockets to the openings. Paul plays the perfect game for a player getting a big start, which allowed him to win relatively comfortably. 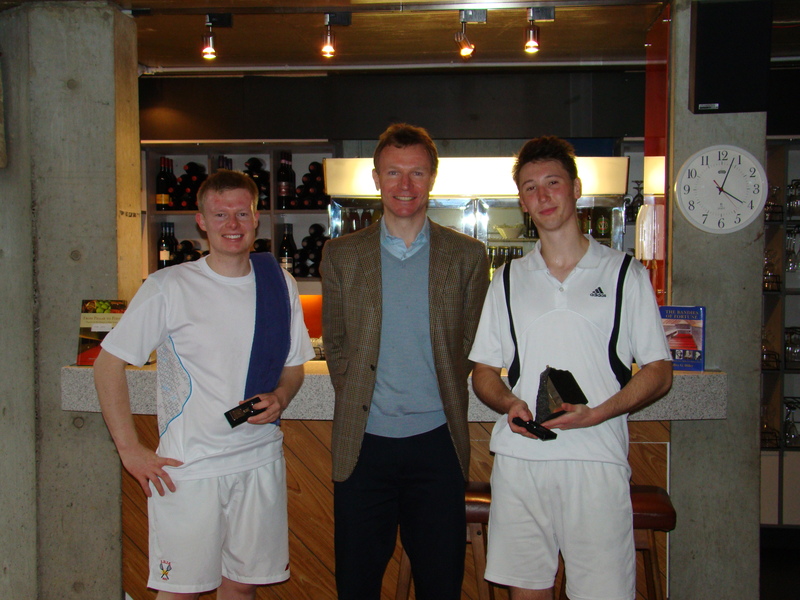 There is no doubt that Paul’s tennis has improved following his recent trip to the UK and US, as has that of fellow tourists Simon Carr and Daniel Williams, each of whom lost only narrowly to Paul himself. All of them will be A-Grade players very soon. The 2009 North African Tournament. The 2009 iteration of the North African Tournament took place on the 211th anniversary of the first day of the Battle of the Nile, which, through the mists of time, must have been divined to be a sufficiently fruity occasion which to commemorate with what has become one of the Club’s more eccentric tournaments. A small, but – to borrow from Sir Max Beerbohm – “perfectly formed” field of six pairs commenced the first of five round-robin matches at the leisurely hour of 10:30 a.m. The Bros. Norton appeared to be the early favourites, particularly given that neither of their opposing pair of Fiona Hewson and Michelle O’Rorke was on court at 10:30. In the spirit of the day no games were docked and the Nortons in any event proceeded to win their opening match. Chris Webb flew in from Dubai to be paired with the veteran beginner Charles Wright. Playing together for the first time, they suffered a number of losses before improving late. The evergreen combination of Jon. Sear and R. McCahey as always combined well, though not quite well enough to qualify for the final. Jonathan’s usual ebullience was on display in his devilish Farouking, while Rob’s cunning serving produced a number of aces. The combination of Jeffrey Bird’s genteel stroke play and Tony John’s vigorous forcing claimed many victims throughout the day. Looking a certainty to qualify for the final, this charming duo inexplicably lost 7/3 in the last of their round robin matches allowing Lizzie Brown and Andrew Schnaider to sneak into the final by the narrowest of margins. Lizzie (or “Zizzee” as she was known on the day) had early that morning secured some industrial strength theatrical make-up. She applied it liberally; so much so that she emerged from the taxi which conveyed her to the Club several shades darker than her subcontinental driver. Some of the banter which was caused by Zizzee’s appearance cannot be published on this web site. The experienced combination of Hewson and O’Rorke improved as the day wore on but graciously allowed Schnaider and Zizzee to beat them in the final match. Bird and John and Sear and McCahey missed out on qualifying by no more than an individual game. In the final (timed, as all the matches, to 27 minutes), between the Nortons (owe 30) and Brown/Schnaider (rec ½ 30), the former were heavily favoured, having won all but one of their round robin matches. However, the receivers were off to a quick start, establishing a four-nil lead before a stunned audience in the dedans. According to the modified rules the Nortons gained both a Farouk in every game and an adjustment in handicap (Owe half 30 Rec 15). They quickly won the following two games, but Brown and Schnaider, now on song, re-established a 6/2 ascendancy with not many minutes left. The Nortons were not yet done and set about a rapid and ruthless comeback, serving accurately and laying short chases. The match stood at 5-6 and love-thirty in favour of Brown and Schnaider when the bell finally went. A few more minutes may have made for a different result. Twenty-two players and friends came to dinner, magnificently catered by Ed Dixon. Lizzie Brown, by now back to her natural colour, won the best-dressed lady, judged by Sear and McCahey, in a “hoolahoop-off” from Kate Leeming and Judith Sear. Charles “Ali Baba” Wright was presented with the prize for the best-dressed gentleman, judged by Kate Leeming and Helen Wheeler. Jeffrey Bird introduced in verse a few well-chosen and entirely plausible remarks about the history of the tournament by Jonathan Sear. The night ended in the wee hours with much profit for the bar.